A year ago citizens elected the new Seimas, driven by great expectations. While the majority talks of a vast number of achievements, their political opponents are sceptical of the things done, Lietuvos Žinios reported. Upon forming a coalition government, the Lithuanian Farmer and Greens Union (LVŽS) and the Lithuanian Social Democrat Party (LSDP) pledged to initiate a slew of reforms, but for now the pace of work is unimpressive. The excuse is made that time is needed to gather momentum. However in waiting for that to happen, the coalition itself started to crumble. Meanwhile the opposition highlights that important state tasks require focused authority, much wisdom and political experience, which is clearly still lacking. Seimas Vice Speaker Rima Baškienė of the "Farmers" believes that the past year has been productive, albeit filled with "political turbulence". "We felt much attention from the public. Unfortunately we were not always able to clearly communicate, announce about the work we did, be more open," the member of Seimas admitted. According to her, this is one of the reasons why the Seimas' public prestige has failed to rise. "We are now awaiting our most important task – forming the budget. As you know, after the elections we inherited the previous government's budget, based on which we had to live all this year. Furthermore we can be glad that there is good tax collection, we have opportunities to resolve certain social problems. It is easy to do when there's funding for it," the Seimas vice speaker said. According to her the seeds are now being sown for a harvest that will be felt by most people. R. Baškienė claims that a significant amount of time and effort went into coming to terms with their relations with their coalition partners, the Social Democrat Party. "This raised extra tensions. However political life is never tranquil, thus much needs to be endured, we must seek compromise," the member of Seimas said. She expressed hope that the Social Democrats' actions will continue to be guided by state, not party interests. "We could do politicking, playing at politics, but I believe we all feel accountable to the people. And in decisive moments we usually always come to terms," R. Baškienė assured. The "Farmer" applauded how the LVŽS group has significantly changed over the year, grown stronger and more politically mature. "It did not fracture or dwindle, only two colleagues departed. However the Social Democrat turbulence glued our group together. Most understood that political fracture will bring nothing good," the Seimas vice speaker said. Algirdas Sysas of the Seimas LSDP group says that the past year of term has been interesting due to "the colour green and agricultural theme." According to him, the new people who entered Seimas thought they will save Lithuania, but it would appear one thing was said and another ended up being done. "A traditional transformation," the member of Seimas concluded. He stressed that the Seimas of previous terms with musicians, singers, colourful personae and representatives of the "purple" party exhibited uniqueness, but this term's composition has granted "new peculiarity." Of the key promises fulfilled by the majority highlighted only the somewhat amended, but not as much as promised, Labour Code and the more strict children's rights law. "However everything else is delayed. The social model remains a fiction because on arriving the government suspended it coming into power, passed a few amendments by January 1 and has not done anything else since. In other words the social security system is not changing, the base pension is not being shifted to general taxation, there is no change to Sodra payments," the Social Democrat listed. If the "Farmers" do not listen in to the requests and wishes of other political powers, A. Sysas believes they will struggle. "And if they begin making friends with those whom they categorically opposed prior to the elections or, as they said themselves, would never deal with, "Farmer" policy will continue shifting to the right and will be no different from other liberal governments," A. Sysas mused. 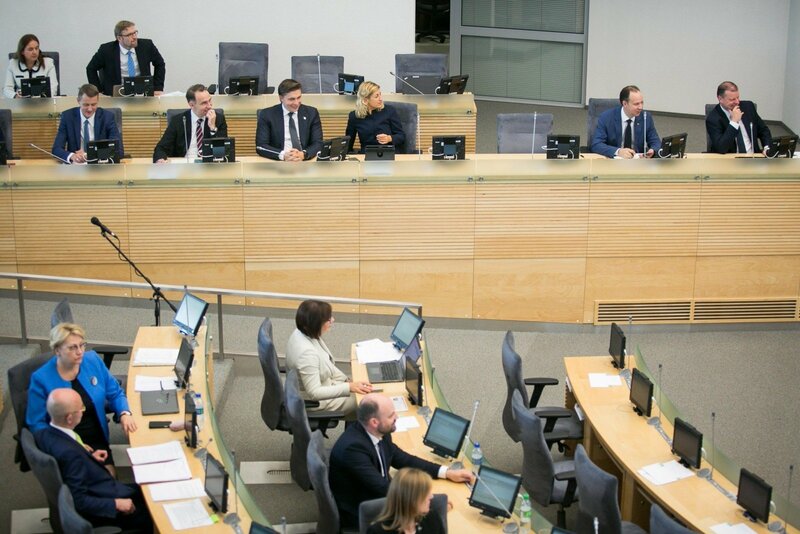 Seimas Homeland Union – Lithuanian Christian Democrat group prefect Gabrielius Landsbergis reminded that the election results displayed that vast expectations were set upon the LVŽS. The number of mandates granted allowed the LVŽS leaders to have self-confidence, bravely hand out pledges, speak of reforms and halting emigration. "This created a situation where people were awaiting significant changes. This demanded focused authority, much wisdom and political experience which is clearly still lacking. We now see what all of this ends up with – a fracturing coalition, fracturing Social Democrats and certain laws being passed only with the help of the opposition. I have to admit – this is an unfortunate circumstance," the Conservative said. The main tasks that are, according to G. Landsbergis, moving forward are those where the opposition's views match the "Farmer" position and the LVŽS is seeking compromise with other parties. "Take alcohol for example. Certain initial precepts were dismissed, less radical compromises were agreed on and the decisions that were finally made were worth practically the whole Seimas' support. Is this a great success? Would I attribute it to only the "Farmers"? Certainly not," the Conservative leader stated. In order for important reforms to proceed, G. Landsbergis believes the "Farmers" must seek agreement in Seimas between the majority and opposition. He lamented that sometimes the LVŽS stance is arrogant. "A winner's halo is blinding, then it is no longer possible to find the need for common ground. I am subjective on how the "Farmers" view the opposition. But I also see the Social Democrats from the side. The whole epic of Saulius Skvernelis and Gintautas Paluckas began when upon G. Paluckas being elected, the prime minister refused to meet him and offered to return to reality. This is certainly not the attitude which can help seek common ground in the future, which would permit rapid decision making," the politician pointed out. While the formal structure of the Seimas has not changed over the year, the prevailing calm is fragile according to the Seimas Liberal Movement group prefect Eugenijus Gentvilas. "When we mark the first anniversary of this Seimas on November 14, it could be that there will be more Seimas groups than a year ago. Firstly I am talking of the Social Democrats who are in the majority. It is clear that the LSDP group is on the verge of breaking up," E. Gentvilas said. According to him, the majority's work over the past year has been chaotic, "Farmer" leaders Ramūnas Karbauskis and S. Skvernelis struggled to come to terms, there was tension between the coalition partners. E. Gentvilas guessed that the first year of Seimas will enter Lithuanian history for at least two things that have never happened before. Firstly it is the agreement to pass forestry reform, it was signed by the LVŽS group and the opposition Conservatives, side-lining the coalition Social Democrats. Secondly – the agreement over coalition work not between parties that won the Seimas elections, but between parliamentary groups – the LVŽS and the rebel Social Democrats. The politician admitted that the Liberals have had a difficult year themselves. While they managed to enter Seimas following the scandal surrounding the party's former leader Eligijus Masiulis and succeeded in establishing their identity, another difficult period has arrived according to the Liberal Movement Prefect – suspicions have been raised regarding the party. "I believe we will survive everything and will perhaps grow stronger," E. Gentvilas hope, noting that he does not expect any great changes to this Seimas' operations next year. "Hopelessness prevails regarding the overall organisation of work. The majority open a vast number of projects, but then do not manage to agree on them. Today we are hostages to the autumn session agenda – 525 projects are proposed, but so far we have only moved 40. We will soon discuss the budget, thus everything will have to be shifted back. Hopefully we will manage to move 150 projects," E. Gentvilas said. Vytautas Magnus University professor Algis Krupavičius scores this Seimas' first year seven out of ten. "After the elections the majority successfully formed a cabinet and with minor bickering passed a number of the planned decisions. On the other hand there was too much miscommunication within the coalition. Today the LSDP has departed the coalition and the group remains in a sort of weightlessness. As such there is no political stability in Seimas," the political scientist stressed. As the current parliament is, in terms of composition, ideologically varied, the political scientist believes what could happen is that the "Farmers" may have to govern alone. "If acting with wisdom and seeking allies for individual decisions, a minority cabinet could work. I believe that threats to this cabinet may arise with the arrival of the presidential elections," A. Krupavičius guessed. At the same time he noted that there were more scandals than necessary over this year in Seimas. "The parliament's reputation was not aided by this. On the other hand, after many years, the Seimas Speaker has ranked within the top three most popular Lithuanian politicians. As such, while the Seimas' work is received critically, it is conceded that it contains authoritative politicians," A. Krupavičius stated. What awaits the Seimas next year is hard to predict, he notes, because Lithuanian politics are greatly deteriorating. The first word that comes to the mind of Mykolas Romeris University docent Virgis Valentinavičius when summarising the first year of this Seimas is "chaos". "There was a lack of consistency and direction, a great deal of working ad hoc. From forestry to alcohol, to children's rights; it is hard to see one line, one single strategy," the political scientist noted. He finds it odd that the LVŽS and the "rebel" Social Democrats are emphasising the discussion of whether there currently is or isn't a majority. Specifically the "rebel" Social Democrats intent on remaining in the coalition stress they are making their "sacrifice" because they wish to retain a majority. "However in my opinion the main problem is not that the "Farmers" do not have a majority, but that they lack a strategy. It does not exist because there is no clear leader. The two-headed leadership of R. Karbauskis and S. Skvernelis has shifted to the advantage of the latter due to Greta Kildišienė's scandal. But if S. Skvernelis is the real leader today, we do not see it," V. Valentinavičius pointed out. As the opposition's work partly depends on the majority, the political scientist believes that it also could not escape elements of chaos. "The Conservatives began attempting to prove the cabinet lacks a majority. But it is completely pointless, the cabinet is working under minority conditions for almost a year. The Conservatives' attention should be drawn to the lack of strategy, this is why it is unclear where this cabinet is headed," the expert explained. The next year of this Seimas term will be similar to the first, he guesses. "All the premises remain – there is a large, but incompetent, unprofessional and completely unprepared for work LVŽS group. It is unlikely that the "Farmers" will learn anything more over the coming three years. On the other hand, they will seek agreement with various parties for various questions; certain matters will proceed and decisions will be made. Since snap Seimas elections are impossible in the Lithuanian political system, this "pleasure" will remain with us. It will not happen that the Seimas will do nothing, but it will neither achieve anything great," the political scientist said. Journalist and political analyst Rimvydas Valatka had the following word to describe the eleven months of this Seimas term: tragic. "And the more Lithuania needs balanced and wise policy, the more "nonsense" is being done in both Seimas and cabinet. Perhaps the greatest effort went into areas that are completely insignificant – the supposed fight against alcoholism, all sort of in vitro fertilisation and such. During this time we have heard some five different variants of tax changes. This is not done in a civilised society because it completely unbalances the market and scares away investors. One day a Sodra ceiling exists, next day it doesn't, third day it returns again. I can say this – one hand knows not what the other is doing. In this case perhaps we can even identify that one hand is R. Karbauskis and the other – S. Skvernelis. They often act in different directions, sometimes Viktoras Pranckietis also begins to want to act as the second official of state. Indeed these have been a very bad eleven months," R. Valatka stated. The Seimas has manage to survive a number of scandals. For a time the story of the relationship between R. Karbauskis and now former parliamentarian G. Kildišienė remained among media headlines. Law enforcement has declared suspicions toward former Liberal Movement member Gintaras Steponavičius. Impeachment procedures have begun against social democrat Mindaugas Bastys over suspicious links to Russia. There are discussions of removing legal immunity from Kęstutis Pūkas under accusations of sexual harassment. The Seimas is also investigating social democrat Artūras Skardžius family's interests in the energy sector. This Seimas, R. Valatka notes, is exceptional in how many more of its members entered politics accidentally. "Take K. Pūkas – such individuals should not be in politics at all," he said, adding that the parliament has so far avoided the practice of "if he's ours, we'll defend him to the end." However according to R. Valatka, this does not mean that can't surface in half a year or later. For example M. Bastys can be valued as an extra vote for the coalition. R. Valatka does not believe that the turbulence in the LSDP will have any significant impact for the current political conjecture and government stability because over eleven months we saw that in some questions the "Farmers" can form a majority with the Conservatives, while with others – with a part of the Conservatives, Order and Justice or Polish Electoral Action – Christian Families Union. "We need not worry about it because the cabinet does not fall when it loses support in Seimas, but when an alternative coalition matures, those who wish to take over cabinet appear. I see no such entities forming in Seimas in coming years," the analyst said. The majority is planning tax and state service reform, promises to reform higher education. R. Valatka believes that for the autumn session the "Farmers" plan to present over 400 legislative projects. Regarding this he accented that firstly the LVŽS need to reduce the number of submitted documents tenfold. "The second priority is to not make changes if unsure that the new variant is better. Considering some of their reforms, it looks "ok" when the reform is supported by a rector who hasn't plagiarised his doctorate dissertation. The reform is already compromised. Though a month has already passed since the fact surfaced, the minister of education and science has remained silent on the question. This can be said about many of their so-called reforms. Tax reform – from the minister of finance, V. Pranckietis, S. Skvernelis and R. Karbauskis we have already heard some five variants. This is also discrediting to the reform because no-one knows any longer why the taxes need changing. Some say – due to justice, others – because the government would gather more revenue, others yet – because something is wrong overall. As in any job it is important to do something and then we can talk when it's done. Up to then projects must be prepared so there are as few ambiguities as possible. Currently only ambiguities can be seen," the analyst criticised.